From 22 to 24 February 2017, EBLIDA Executive Committee members were in Malta. Since January 1st 2017, Malta has ran the EU Presidency of the Council of the European Union, a huge task for the country. To celebrate the Maltese Presidency, EBLIDA Executive Committee and the Malta Library and Information Association (MaLIA)agreed to host the EBLIDA meeting in Valletta and to organise a special library tour inviting Maltese MEPs. 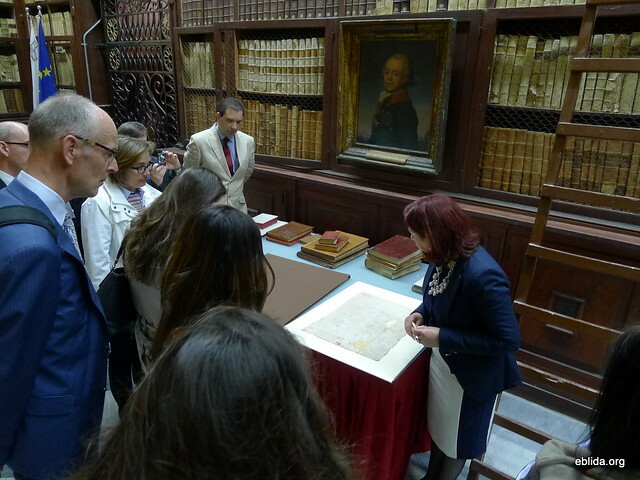 On 22nd February, Maltese colleagues and members of the Executive Committee gathered in the National Library of Malta, Valletta, for a special presentation of its treasures and rare manuscripts. On this special occasion, EBLIDA and MaLIA invited Maltese MEPs to join the library visit followed by a round-table discussion addressing the needs of libraries in Europe and in Malta especially in these times of copyright reform discussion. MEP Alfred Sant (S&D, Malta) joined the delegation for the library visit for a short period of time before departing for another commitment. The official delegation of 13 Maltese librarians and the EBLIDA Executive Committee members, as well as a representative of Public Libraries 2020 and a member of the French Library Association met for a round table discussion on the challenges and opportunities in libraries. MEP Therese Comodini Cachia, rapporteur for the JURI Committee (leading the committee for the Copyright Directive in the European Parliament) joined the round-table discussion for an animated discussion on the Copyright Directive Proposal of the EU Commission. Both Maltese librarians and EBLIDA Executive Committee members expressed the need for reform to ensure that libraries can continue to fulfil their missions in a digital environment. EBLIDA in particular emphasised the point that that in order for free circulation of knowledge to become a reality, support for real reforms and a robust, mandatory and user-friendly set of copyright exceptions is needed. This will strengthen the fight against piracy by providing legitimate alternatives in which library services to its citizens will flourish. On 23d to 24th February on the invitation of the Malta Library and Information Association (MaLIA), EBLIDA Executive Committee members met for their first meeting of the year in the National Library. The meeting was held in the board room of the National Library in the midst of rare books and manuscripts. EC members welcomed Hannah Gent, Project Officer at Public Libraries 2020, for a detailed presentation of the MEP Library Lovers group launched in October in Brussels. EC members then worked for 2 days intensively on EBLIDA’s current and future activities. EBLIDA would like to thank everyone for a wonderful and inspiring meeting and we would extend special thanks to MaLIA and its chair Martes Pfeiffer-Paris and to the National Library of Malta and its CEO Cheryl Falzon for hosting the meetings and make all of this a reality. Pictures 1 and 4 courtesy Jean-Marie Reding / Pictures 2 and 3 courtesy Jesmar Baldacchino.